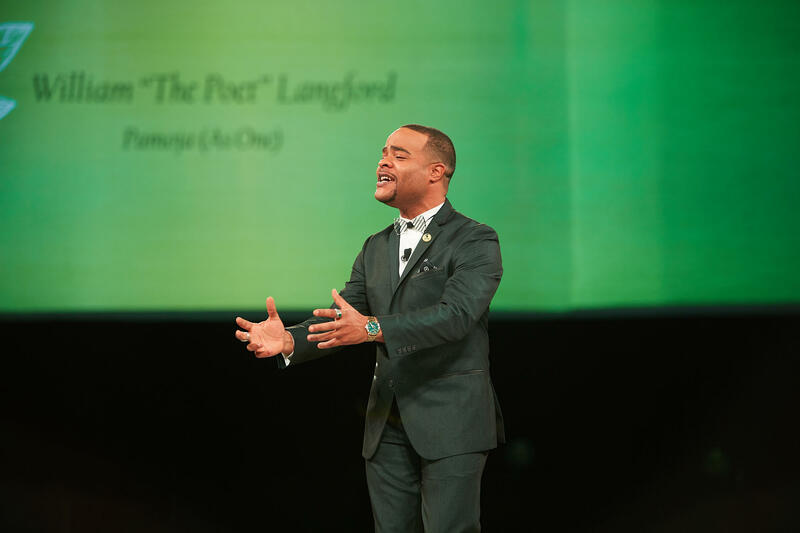 Alumnus William “The Poet” Langford (’11, College of Arts and Letters)—a modern-day poet, teaching artist and Fulbright scholar—performed the original work, Pamoja (As One), at the Empower Extraordinary campaign celebration on October 19, 2018 at the Breslin Center. The poem, dedicated to campaign donors, conveys a message of unity for Spartans across the globe. 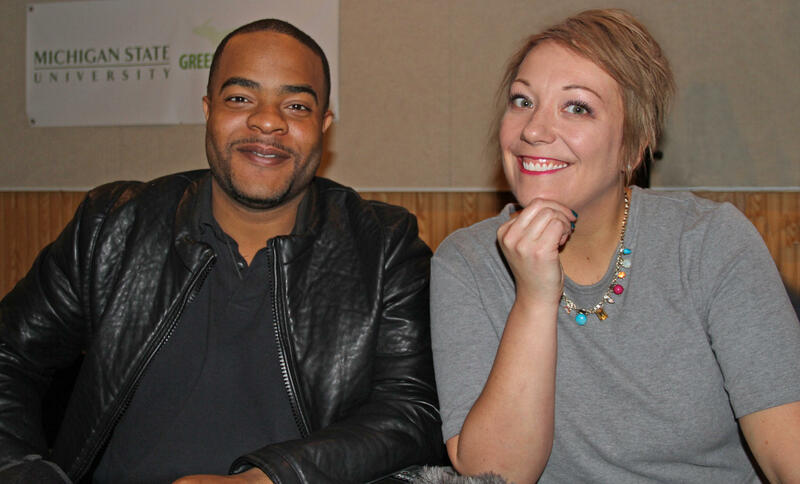 Will "The Poet" Langford talks with Sarah Wardell. When translated from Kiswhili to English, the poem’s title Pamoja means as one. Langford draws inspiration for his creative work from his time in East Africa, and through roots in Detroit and East Lansing. He is the lead language arts instructor for the Michigan State University/Marshall Mathers Foundation project VERSES: Exploring Literacy Through Lyrics and Song. Langford talks with Sarah Wardell about the project. Sarah Wardell: We want to talk to you today a little bit about a project that we have been working on called Pamoja. Tell us what Pamoja is. Will Langford: Pamoja is the Swahili word meaning as one. In addition to its resonance for the Michigan State University community and our need to unify in this moment, it is also a common language in classrooms. As a Fulbright scholar, I was stationed in Western Kenya at a school called Salvation Army Kolanya Girls National Secondary School. So after a teacher has explained a dense, weighty topic of some sort to make sure that students are following along, that teacher might say to tuko pamoja, like, are we together or are we one? So to a degree my choice of that phrase reflects my teaching experience and my language experience in Swahili, specifically in the context of my teaching in Kenya. Wardell: So let's back it up a little bit and talk about what brought you to Michigan State and what you gain from being here. Just talk a little bit about your path and what's brought you to this point? Langford: I had wonderful English teachers and teachers broadly at Cass Technical High School from which I graduated in 2007. There was Dana Davidson, Laura Lynn Taylor, and many others I could name and phenomenal teachers there now as well. Dana Davidson in particular had a poetry recitation assignment in her AP English course. And that assignment tasked us with finding a published poem on a particular topic and memorizing that poem. It had to be a certain length, right? We weren't allowed to escape with haikus. We memorized that poem and Mrs. Davidson sat at the back of the classroom and looked at that poem as we recited it from our memory. So those were some of my first experiences with the task of taking on memorization. And I chose in a lot of those scenarios to rather than finding a published poem to write them myself. So I was writing my own poems, memorizing my own poems and performing them for my English class. So I had a captive audience, an encouraging teacher and a task to achieve. And I think those moments with Mrs. Davidson and similar moments later with my other English teachers helped me to have a desire to study English and perhaps to teach it somewhere along down the line. So I joined the College of Arts and Letters here at Michigan State. Specifically I was an English major and here too I found encouraging educators in the College of Arts and Letters and more broadly who challenged me and just as importantly believed in my work. 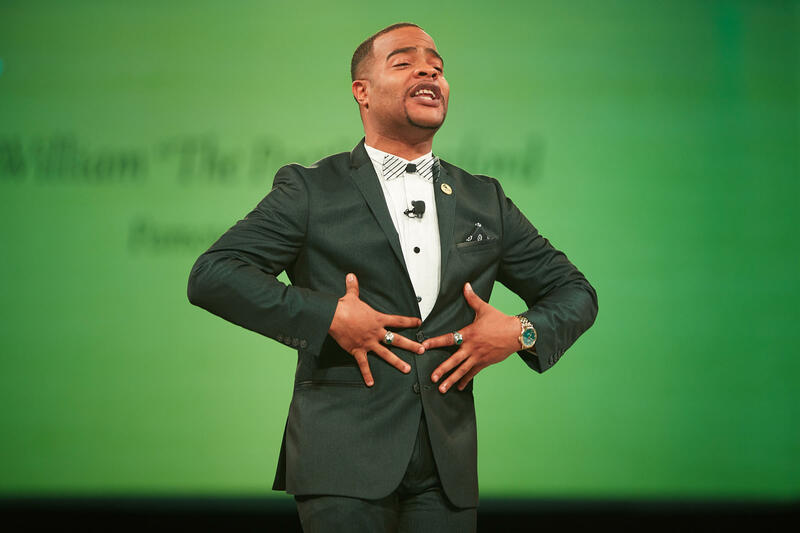 Will "The Poet" Langford performs "Pamoja (As One) at MSU's October 19, 2018 Empower Extraordinary celebration at Breslin Center. Wardell: What were some of the other things that you did while you were here? You started the MSU slam poetry team. Can you talk a little bit about that? Langford: Here at MSU I was an RA, a mentor in the dormitories, and that gave me a lot of proximity to student organizations and university-led social events. And my experience in the RA program sort of gave me the feeling that I could bring together a student organization that focused on poetry and establish the community here for creatives. One of the things that I think many students find in that transition from high school to university is that maybe that club or that social structure or friend group from high school isn't something that you can find easily. But I think one of the ways that we manifest the community that we like to surround ourselves with is by creating or joining a student organization on campus. There are organizations like the cookie club. There's a rowing club and a judo club, and the MSU Slam Poetry Team. There are countless student organizations. So with a splendid executive board team, Zayn Shamoon, Megan Snively, Michelle Hooks, later Jimmy Choi, and so many people, too many to name who've done wonderful work. We collaborated and decided on a set of best practices on how we would conduct writing workshops and performances within the MSU Slam Team. We found spaces. Initially we were so small that we met inside of the Biggby that was located in the MSU Union and it was tiny, really tiny. There was probably space for the four of us at one table and maybe like six additional people in the whole café, but we made it work. And as we traveled across the state of Michigan primarily and also across the campus, the organization grew. I think not only because it gave people access to a community of peers engaged in the arts, but also a peer community where you could bring your troubles from the week or the weekend or a struggle that you're having in your personal life or emotionally. The MSU Slam Team was and continues to be a place where people can bring their authentic self and they can share it either poetically or just by talking to the community of people who occupy that space. It's amazing. I've seen many iterations of the Slam Team in my years and the faces change. The types of poems change. Lots of things change with that turnover. But what doesn't change is this feeling of acceptance, of warmth and of safety in that space to share. And that makes me happy. Wardell: So for people who are listening who don't know what slam poetry is, can you in a sentence or two say what exactly that is. Langford: For persons who might be familiar with forensics competitions or debate competitions, slam has some analogous components. But there are actually quantifiable rules for a poetry slam. Poets write an original poem. That poem is usually about three minutes in length. Many slams allow for poets to go up to three minutes and 10 seconds for the length of a poem, but beyond that there's actually a numerical penalty for that poem extending beyond its prescribed length. There is the notion that poets are battling, but because the poems are typically memorized and written beforehand, that element isn't there. Although poets make choices about which poem to perform based on what a person has performed before or after them. That said, a poetry slam selects five random judges from its audience. Those random judges are informed on the way in which these poems are scored from one to 10 with one or two decimal places. One being, I want my time back, 10 being, can I hear that poem a few more times? Can I have it tattooed? At the end of one or two rounds, the poet who has the highest cumulative score, having dropped the lowest score and the highest score, is awarded the winner. So theoretically, the maximum score that any one slam poem can receive is 30 points. The reason we're dropping the high and the low is because of just the inevitable bias, even among strangers. There are poetry slam competitions at nearly every level. There's a Rustbelt Poetry Slam, there's a National Youth Poetry Slam, there's a Collegiate Poetry Slam as well. And poets participate in whichever ones strike their fancy, and especially if they're on a specific team of poets. Wardell: So let's just talk a little bit more about poetry in general. Why is that important right now? What makes it relevant for the times that we're living in? Langford: I think of myself in many ways as a storyteller. So many of my poems begin with anecdotes. And I like the opportunity to be able to share my view of the world, of the city of Detroit, of East Lansing, and that view of course incorporates different voices and experiences. But I know that my capturing the conditions in which I live, the way in which I see the world is limited. So I teach. I tell all of my students, no matter what level they're at, who have different levels of proficiency or ideas about their own proficiency that there is a story that only you can tell. That's what I think. I encounter people and they say, "I don't know if I could write poetry. I don't know if I could tell stories. I don't know if I could do what it is you do." But I'm not what makes the art special. What makes it special is the fact that no matter what decisions you make in any order, you're the captain of your ship. You have a story that only you can tell. And only you can tell that story the way that you will. So poetry has been a way to inspire people to tell their story, to add it to the conversation, and to see that their voice is a necessity for the tapestry to take on the beauty that it does, the complexity that it has. We need every voice. And not all of them will manifest as poetry, right? Some people are painting. Some people are designing interiors. Some people are making their mark on the world by the way they design a sustainable building. Right? But I see this as a way to make room for all the voices we need to hear and I think that's what we need more of. Less moments where someone is shut out because of the way they tell their story or the form that it takes, but instead making room for people to share their experience and their piece. I think we achieve a sort of peace by giving people room and deliberately making spaces for people to do that. Wardell: Is one of the ways that you're of making space the Verses Project? Langford: Yes. Oh the Verses Project. The Verses Project is a great opportunity to make that creative space that authorizes the voices of young creatives and kids in Detroit and in Metro Detroit. So the Verses Project is an amazing teaching collaboration and partnership with the Marshall Mathers Foundation at the MSU Community Music School in Detroit. Essentially what we're doing is I'll brag about my colleagues. I work with a host of phenomenal educators. And we have groups of students ages about 10 up to 17. We teach those students vocal music, instrumental music. And my contribution is primarily in terms of song lyrics, right? I teach the students poetry. I teach them about cliches, similes, metaphors, alliteration, the list goes on and on. And by combining our different skill sets, we are helping the students to sort of round out the pieces they need in order to compose their own original song. So students are divided into groups of about four or five and they undergo the entire song writing process from composing lyrics all the way to mixing the digital track that the students produce. At the end of the semester, we host the final listening party, we interview our students and we give them a lot of the experiences that they might have as professionals in the music industry. But I think most importantly, the students feel authorized to tell their story. Their version of Detroit, not that of their instructors. Their experience of being a student in school at this particular time in this particular moment. That is what we're celebrating. The growth of their confidence and their sense that their story is necessary. To understand the city of Detroit, you have to listen to the kids. And this is a great way to give their voices a platform to be part of that conversation. Wardell: You're also a kid from Detroit. Did you have any mentors growing up and what inspires you now? Langford: I've had a host of really dedicated mentors over the years. I've traveled in a lot of different creative and academic circles. So I have mentors in different spaces who have worked with me in different capacities. In high school my English teachers were my mentors. They encouraged both my academic writing and also my creative writing. And they were always a listening ear or a watchful eye over the things that I had written and they helped guide me and helped me to grow in my confidence as an oratory and as a writer. My biggest mentors though would have to be my parents. My mother is now retired, but was a career educator. And my father also worked for the Detroit public schools. Their example of dedication, of hard work, their commitment to education and their expectation that they said early that I would go to college. I knew I was going to college before I could pronounce the word college, and I owe that to my parents. And while I realized that particular pathway might not be the one that everyone seeks or the one that is most fruitful for every individual, for me, it set me on a trajectory that leaned into my love of learning and of being in school and teaching and all the deliberate care that goes into those things. As an artist, I've been fortunate to live in a magnificent city for artists. So I was mentored by the late poet Blair, Jamaal May also a poet from the city of Detroit and more people than I can name honestly. I danced for a while, tap jazz and ballet. So my dance instructor Veronica was my mentor for a long time. I was in dance longer than I was at any particular school because the school didn't change every four years or five years or whatever the case may be. So Ms. Veronica as we called her was my mentor from the time I was five or six until the time I graduated from high school. I danced that whole time. But she saw that the artist that I was going to be would be a poet. That shift happened despite the fact that I danced at that point in my life much longer than I had written poetry. So, currently, I am a doctoral student in my first year. I am in the College of Education specifically in the curriculum instruction and teacher education program. Currently I am teaching learners and learning in context. It is a course in the College of Education where my students visit local schools and not only survey a career teacher, but they also read with students one on one from a novel. So it's been an especially exciting time to work with MSU students and a fun and new challenge. Wardell: So what inspires you? Langford: One of the themes that runs through a lot of my writing is hard work. Living in the city of Detroit, I'm inspired by how hard people are working to make lives for themselves, for their families, for their children. The city has responded to all manners of devastation, of setbacks. But Detroiters are resilient. I was saying earlier, our motto is "Speramus meliora; resurgent cineribus. We hope for better things, it shall arise from the ashes." And I think that spirit of hope, of renewal, of dedication is one of the things that inspires a lot of my writing. A piece that I wrote recently for the Motown Museum's spoken word artist of the year competition, cogitates on the state of the new Detroit. And there's a section that says, "Tell them about black bottom. Tell them how we bounce back from devastation like dandelions, gnarled and still shining. Joe Louis on the ropes, gliding through shots to the body. This is the Motown sound. A supreme three par Copa Cabana Cornucopia to uncloud your cornea. And God is writing this album from the top down. We're living for the city. We're headed for higher ground. I've watched Detroit thought drowned, thought defunct, rise like the earl, a funk through our eyes. We see miracles on every corner. Detroiters hustling harder from the checking goal on compo to the wonder of a young Stevie sound check in the Apollo." And it goes. And I continue to be thus inspired by my city, but I'm also inspired by educators. I'm inspired by graffiti. I'm inspired by the work of artists and all manner of mediums. Wardell: So let's bring it back to Pamoja a little bit and talk about what inspired you specifically to write Pamoja. Let's start with the idea and where that came from and what inspired you to write that specific piece. Langford: With Pamoja, one of the things I was most interested in was that the piece had this character. It's hard to define. But that it was urgent, but hopeful. That it would be inspiring, but that it would also instill the sense that we have worked to do that. The legacy of Spartans is something that we can and should take great pride in. But we also have a responsibility to carry that forward in our work. Whatever it may be. No matter which department you're in. No matter what your trajectory academically might be. There's a call, our carillon's calling Spartans to new missions. The idea that we're called to serve. We're called to use the experiences and the mentorship, the learning that we receive here to do something bigger than ourselves. And I think that each of us summoned our courage to own up to that. To accept that it's okay to be proud to be a Spartan. To accept that there's work to do. To accept that you don't get to rest on the laurels of legendary Spartans, right? You get to be one. Yeah, you get to be one. So Pamoja is created in that spirit to celebrate, but also at the same time to motivate. So the piece looks at not only work that's happening here at the university now, but also the way that what we do now makes so much possible. It can be difficult to see that pendulum of progress swinging right? But we're pushing it with the work that we do every day. So in some sections I'm talking about the facility for rare Isotope Beams. In some sections I'm talking about the Spartan Day of Service, right? The Sun rising on the day with 7,000 hours. That day is, that number I should say is quantified by the number of hours that Spartans donated or volunteered on that day. So it's sort of a mixture of different sections of work that Spartans are doing to be proud of, but also a call to continue that work in whatever area it might take place. 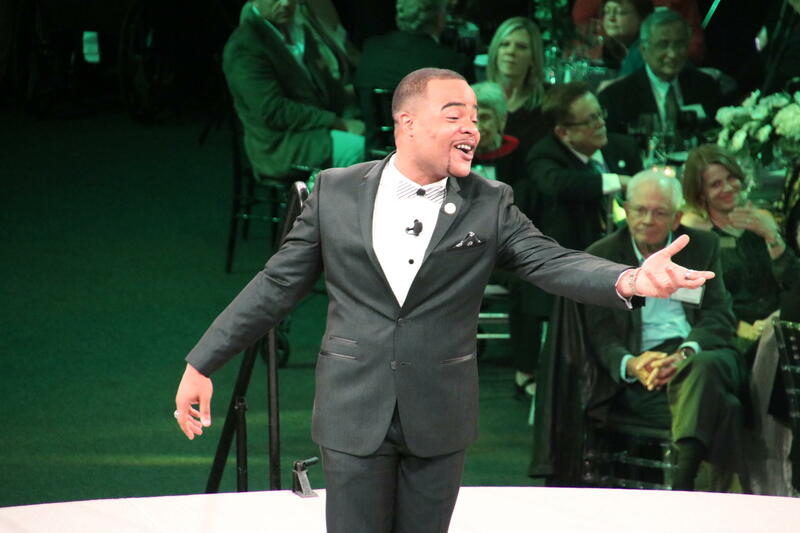 Wardell: You dedicated Pamoja and performed it for MSU donors and friends at an event on October 19th. You worked with the MSU Advancement team. Is that common for this type of work? Was this a common project? Langford: I've had a bit of experience working with different departments at the university on different pieces of poetry that commemorate special moments at the university. So I've written a host of poems about Michigan State, which as an artist is not something that occurred to me that would take place during my career or form a big section of it. There was a groundbreaking at Wells Hall some years back before the renovation. I wrote a poem entitled Legion in order to commemorate that event. Similarly, I've also composed two other pieces in the vein of the Spartans Will campaign. One is a schooled reflection on experiences of alienation and overcoming that out of your depth feeling that a lot of students have at a research one university with over 45,000 students. Also Uncommon Will, which is a reflection on the need to include everyone in education no matter what their background might be and making sure that we're making spaces for everyone to feel welcome here and more widely. And most recently for the Pamoja project, I should say. The prior projects were collaborations largely with Communications and Brand Strategy. The wonderful fellows at cabs, well ladies and gentlemen at cabs I should say, are phenomenally a creative warm, funny group of folks and I say all of those with love. This project with University Advancement has me in a familiar but new territory. Because each time that I'm called to write about Michigan State, there have been new achievements. Our history, our present keeps changing. So the things that I write must respond to my vision of where MSU is at, in collaboration with what our goals might be for that particular piece. So looking at what work is happening at MSU. What are some trends in the student body? 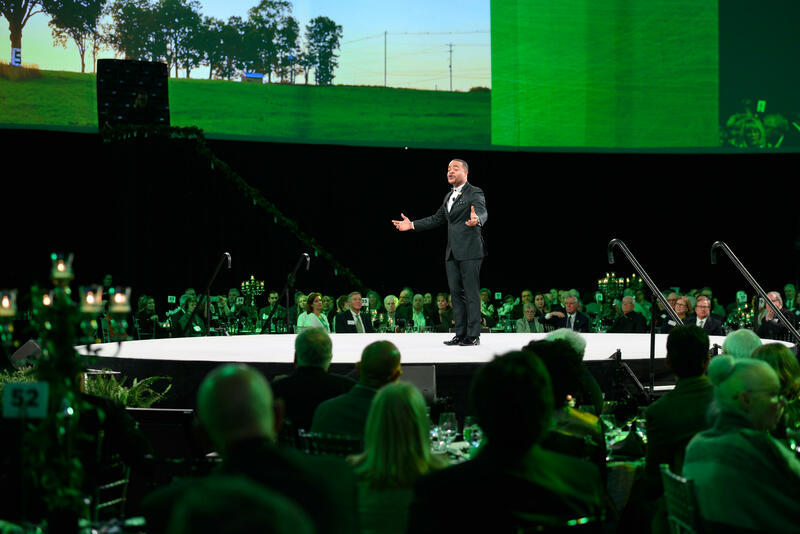 What projects is Michigan State University and the larger community excited about? And what are we looking forward to down the line, even if it hasn't been slated as an official project? What are we hoping for? What are we looking to the horizon to see? Wardell: And that's really what the message is behind Pamoja. It's that message of hope and what's possible. What's been the reaction so far to this piece? Langford: Thus far, I think the reaction has been really positive. I feel that the sense of hope I'm hoping exists in this piece. I feel like people are responding to it. I feel like this piece is helping to conjure that complex relationship between pride and a sense of duty. And I think that if those things can exist simultaneously for people, then there's great potential, right? If you can feel proud of your progenitors. If you can feel proud of the donations people have given to build facilities that they might never see. If you can feel proud of the work that educators have done to lay the groundwork for your career, then I think a lot is possible. And if looking at the examples of Spartans helps embolden you to do whatever your work might be, then that's a success. And that's an opportunity for so much progress. So I'd say the reception's been pretty warm. Wardell: When our team, when University Advancement approached you about this project, we said we wanted to just give you complete creative freedom to write what you want to write, what's in your heart. And we had some general guidelines, but ultimately we wanted to really allow you to own that. And so can you talk a little bit about that process for you? What does the creative process look like? Do you like the writing or do you enjoy the performing more? Langford: One of the things I appreciate about this project is the flexibility. The words of Pamoja are entirely of my own machinations. Like yes, they speak to the university, but they reflect Will The Poet style. So there are moments where the subject is changing so rapidly that you might not be able to stick onto any particular moment, right? There's a momentum and energy that build in that piece that I feel really pleased with. But I think for a project like this, the thing that I enjoy is figuring out how to get all these pieces that I would like to see, all these contributions from Spartans, all the hard work. The donations, the achievements, all of these pieces to work together in a narrative with some clear sense of a beginning, middle, and a crescendo of some sorts. So there are fun moments. Kaleb Thornhill is referenced in the poem. And I think unless I say that it might not resonate. But there's a moment in the poem that says "Bringing to fruition from a hill of thorns, the key to reach our apex." So it's a casual reference to the Apex Academy, APEX Academy which Kaleb Thornhill has extensive involvement with. But like getting to sort of drop some of these many, many, many projects, achievements is exciting because it still has the poetic heft to feel like a lot of the slam poems that I've written. But it is also in a sense a chronicle as well, right? And that's what some of the earliest poets chief assignments were. To chronicle a legacy, a history, a genealogy. So it's fun to have the opportunity and responsibility to speak to such a massive and long lived legacy for Michigan State University. Wardell: So what is the best advice you have received as an artist? Langford: One of my favorite poets is a gentleman by the name of Shihan. Sheehan came here to Michigan State and gave a feature performance at the union. The MSU Slam Poetry Team opened for Sheehan's performance. At the end, I asked Shihan if he would sign a poster for me. So Sheehan wrote on my poster. He wrote, "Will don't get caught up in your own hype. Inspire every chance you get." And that I think has been the best advice I've received. I am more interested now in inspiring people to tell their story. I am more interested now in inspiring people to tell their story. I'm more interested in teaching people to tell their story in their way than I am in being celebrated, than I am in my own achievements. In martial arts there are ranks you cannot reach unless your students achieve. So I take great pleasure in the success of my students. In the growth of their confidence, whether they go on to be poets, singers, biochemists. I feel best when I know that my work has helped someone else be a more authentic version of themselves. Whatever that might be. The version of myself that you see on stage is real Will Langford. There's a lot of me in my poems. And I want to encourage people to put their heart, their passion, themselves into whatever their work may be. Wardell: So Will, can you just talk a little bit about how your time abroad inspired you with the writing of Pamoja? Langford: As a Fulbright scholar, I was stationed at a secondary school in a rural part of Western Kenya. Before that time, I traveled on a study abroad program that placed me at the children and youth empowerment center in Nyeri, Central Kenya. I remember one of my first days at the CYEC. I was drinking water from a Camelbak, from one of those backpack water bottles. And there were three or four kids who pointed up at me specifically to my Camelbak and they said, magic, magic, magic. I'm like, no kids. It's not magic it's water. A few days later I was at a café and the waiter asked me, he asked in Swahili if I wanted water. I said, excuse me? He said in English, oh do you want some water? And it occurred to me that those children from a few days before at the CYEC, were attempting to teach me the word for water, which to me sounded like they were saying magic. So in Kenya, I had lots of wonderful teachers and my students and the many young people that I had the chance to work with. And through my experience specifically in such a rural location, I learned Swahili somewhat quickly, enthusiastically. And my teachers, the local community, they were enthusiastic teachers. They made me feel great about my Swahili no matter what I felt about it. They were sure to tell everyone that I knew all of the language. And of course I'd be vaguely embarrassed upon being described this way, but it was such an amazing experience that people were validating my learning. So over the course of the time that I was able to spend in Kenya, I really took studying Swahili quite seriously. And part of the reason why this piece is called Pamoja is sort of to give respect and appreciation to just the myriad of people who taught me a word, or who helped my pronunciation or who encouraged me along the way. So in that sense, it's a nod to teachers and the reality that anyone can be your teacher. You can learn anything from anyone. And I think that type of open mindedness is what we need, right? You live a story that only you know. You know things that no one else would know unless he decided to lend them a hand and share. So hopefully it intrigues people to be curious. Why that word? What does that mean? Maybe I'll learn a couple more words of Swahili. Maybe I'll meet someone who speaks it one day. The intent is to encourage curiosity and also to celebrate Michigan State's work in soil science and clean water action in East Africa where Swahili is something of a lingua franca in Kenya and Tanzania and some surrounding areas. 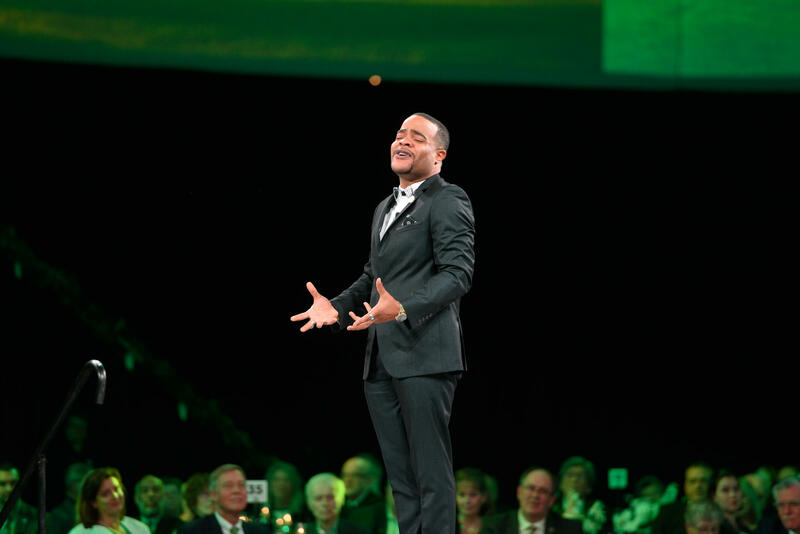 And here is Will The Poet Langford performing Pamoja (As One) This is from Friday October 19 at the Breslin Center as part of the Empower Extraordinary celebration. And WATCH Langford perform Pamoja (As One) on You Tube HERE. PAMOJA (AS ONE)Our impact can’t be packed and shippedand moved by freightit’s not bought and sold andloaded in crates,it’s not in a crestladen with gold and old age. Sowe harken back to seeds planted in this landgranted the promise to flourish, to manifestthe rarest dreams ofisotope beams andtrilling strings in a sprawling pavilion. Bringing to fruitionfrom a hill of thorns the key to reach our apex:to invest. Emboldenedby the sun rising on a daywith 7,000 hours by the power of the crowd,endowed inalienably with the facultiesto seek degrees,to see the forest for all the trees. We dive infor the way is forgedby the next ranksin this Spartan Phalanx. We will go forth,thus adorned in armorthat harbors hope,clothed in fabric that binds us to a truth that reminds usthat we would reach back. But we will walk itas oneto inscribe a legend written todayin the rumbleof our 50,000 footsteps.